The last time I travelled on a National Express coach was over a decade ago as a student. Back then I valued price over comfort. Recently I needed to get from Cardiff to London Heathrow Airport to catch a flight to Tromsø. My options were a train or a coach. 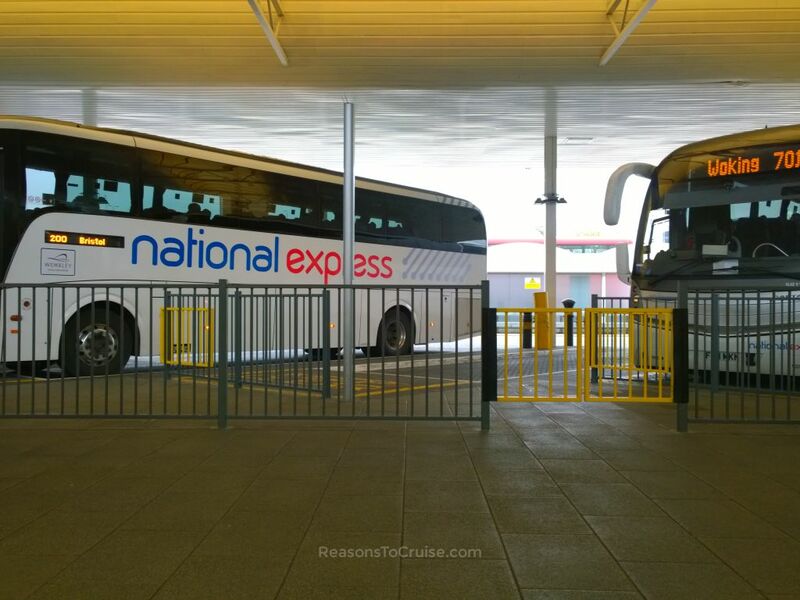 National Express operates several airport routes, serving Heathrow, Gatwick, Stansted, Luton, Birmingham, Manchester, and Bristol Airports. When it came to price, the coach company won hands down. My original quote was £45 return, but this dropped to a bargain £19 return when I booked a non-amendable rate online. By contrast, my quote from Great Western Railway (GWR) for a round-trip rail ticket to London Paddington plus onward travel on the Heathrow Express was £192 in standard class. That said, it is not as cheap as my £1.50 bus ride into London with Megabus. I winced at the thought of three and a half hour journey but realised this was comparable to taking a GWR service into London Paddington and then the Heathrow Express back out to the airport. The coaches were on-time on both legs of the journey, despite heavy traffic in places. I remember the old cloth seats that became fairly uncomfortable after a short while. Happily, these made way for more comfortable leather seats. These reclining seats have a reasonable amount of legroom and a generous width. They also have sculpted head-rests which took the strain of my weary head following a full day of travelling. Along with the leather seats comes a fresh and modern décor. Wood-effect flooring creates a cosy, homely feel and the blue LED lighting adds a modern touch. Large windows let in a lot of light during the day, and the generous headroom in the coach helps to create a sense of space. A decade ago I could not charge up my phone on the then 11-hour coach journeys I took across the country. Times have changed and now I can (although thankfully I no longer need to make the 11-hour trips). I could also have charged a tablet device or a laptop should I have wished. 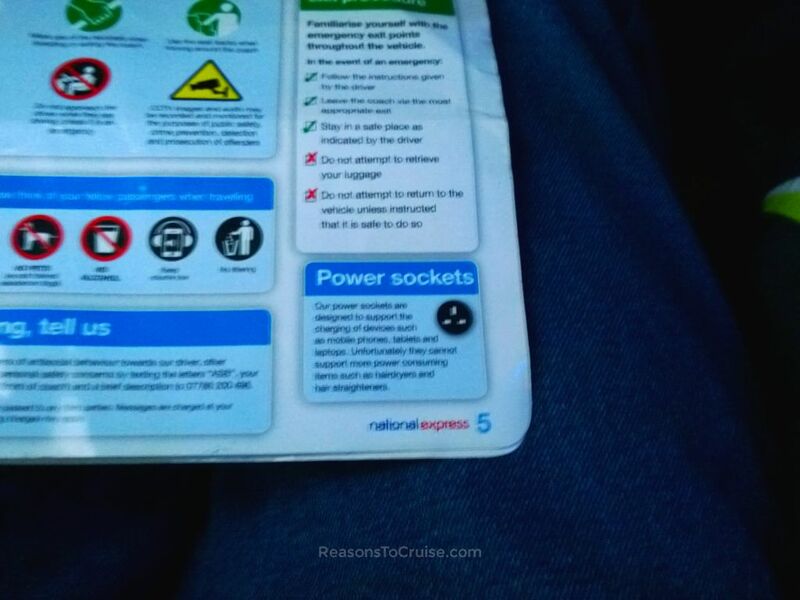 According to this admittedly poor photo of the safety card they cannot be used to power hairdryers or hair straighteners. 'Fess up, who has been trying to dry their hair on a coach? 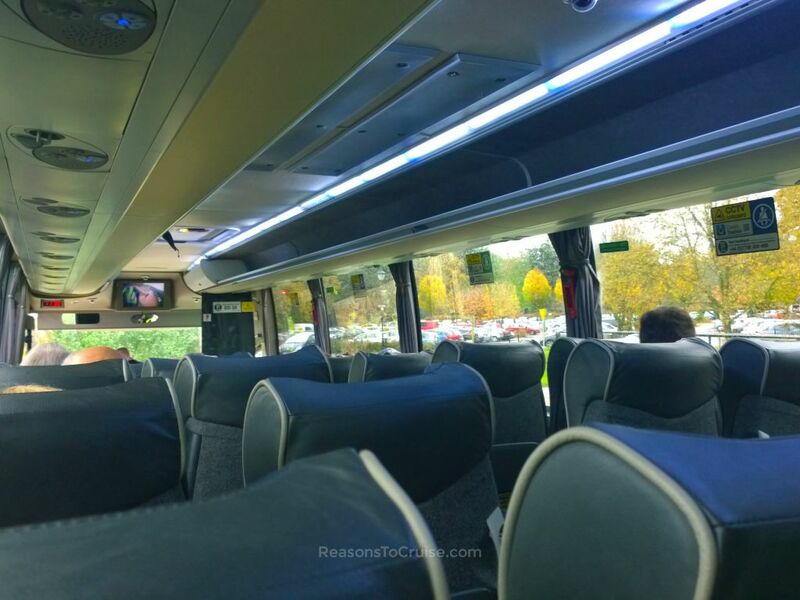 Dash cams are all the rage at the moment and on both the outbound and return coaches streamed live footage from a dashboard-mounted camera to a large television screen at the front of the coach. The screen meant I could see the road ahead (to avoid travel sickness) without craning my neck. I imagine the camera is more for driver safety and insurance purposes than passenger comfort, but it was a helpful addition nevertheless. I thought all new coaches had WiFi onboard these days, but it turns out not all National Express coaches are made equal. While I spent an hour waiting for my return coach at Heathrow's Central Bus Station I noticed some vehicles that had WiFi onboard and others that did not. Both my outbound and return coaches lacked WiFi. National Express' Twitter team have told me they are looking to roll out WiFi across the network in the future. Fingers crossed this will be over the next few months or years and not decades. While this was not a deal breaker for me, it may be for others and so is worth bearing in mind. If you can work offline, perhaps drafting documents or proofreading an essay, then the lack of Internet on the move should not be an issue. As with trains, there is a risk of delays due to traffic jams, roadworks, diversions, etc. Make sure you factor in plenty of time before and after your flights to avoid the hassle of having to change or buy a new ticket. Book early to secure the best price and when you see a good price, snap it up. They don't hang around for long! Take a snack with you in case you get hungry en-route. A supermarket meal deal is ideal. A small bottle of water is also worth taking although you'll need to ditch this at the airport before you reach the security checkpoint. Any long journey can become a bit boring after a while so you may want to take a gadget (phone, hand-held games console, tablet) or a good old-fashioned book to help pass the time. 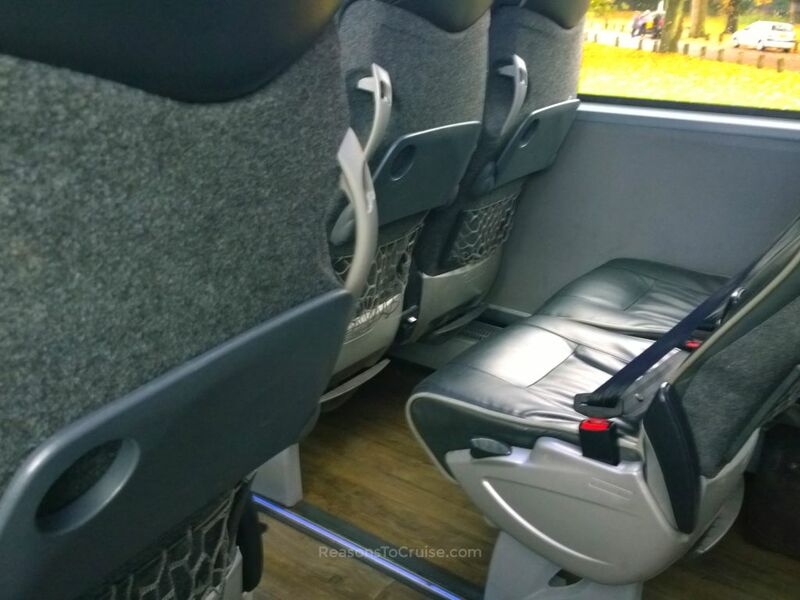 Would you consider taking the coach to the airport next time you travel to save money? Leave a comment below. Disclosure: I paid in full for return National Express tickets. My opinions are my own. My airport transfer service was punctual, hassle-free, and great value for money. The journey time was comparable to my only other option of an indirect train service to Heathrow. A saving of £173 was the biggest incentive to taking the coach this time.